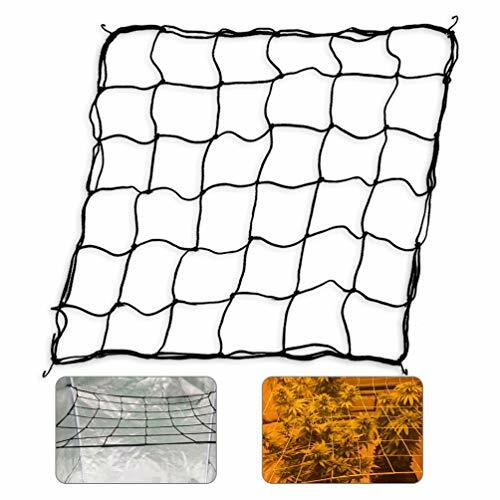 The grow tent net trellis creates a sturdy support structure that will effortlessly bear the weight of even the heaviest fruits and flowers. Modular design with 36 growing spaces. Made of an elastic material. 4 removable hooks included, they hook horizontally on the corners of the tent poles. Ideal for grow tent 4'x4', but will stretch to 5'x5'. You can also fold the trellis and move the hooks to fit 3'x3', 4'x2', or any combination under 4'x4'. Sturdy Support: The net trellis creates a sturdy support structure that will effortlessly bear the weight of even the heaviest fruits and flowers. Elastic Trellis: Made of an elastic material. The durable net provides adjustable elastic support. For Grow Tent: Especially suitable for grow tent 4'x4', but will stretch to 5'x5'. You can also fold the trellis and move the hooks to fit 3'x3', 4'x2', or any combination under 4'x4'. Removable Hooks: 4 steel hooks included, they hook horizontally on the corners of the tent poles and can be taken off. Modular Design: 36 growing spaces. Modular design is ideal for grow tents.